Imbolc is one of our most beloved Celtic celebrations. As we patiently, *cough… cough*, work our way out of winter; Imbolc is perhaps our first glimpse at spring. There are so many “About Imbolc” blog posts out there, including this one by Wikipedia. I thought I would take a different approach and focus on the foods we might enjoy on this day of celebration. After all, we have made it this far through the long cold winter, we may as well make the best of it! Food is such an important element in just about anything we do. The preparation of feast-like meals and family dinners is a ritual in itself. So when we discuss rituals in which we celebrate, we should also recognize the importance of food. Think back to all the pleasant memories you have had with family and friends, I bet there was some sort of food or beverage involved. I think, sometimes we take food, and the efforts required to generate a great meal, for granted. We tend to focus so much on the idea of celebrating, we forget how much thought, care, and time goes into one of the most beloved aspects of celebrating. The FOOD! To someone who is planning a ritual feast, there is much time and effort placed into what to serve and how to serve it. 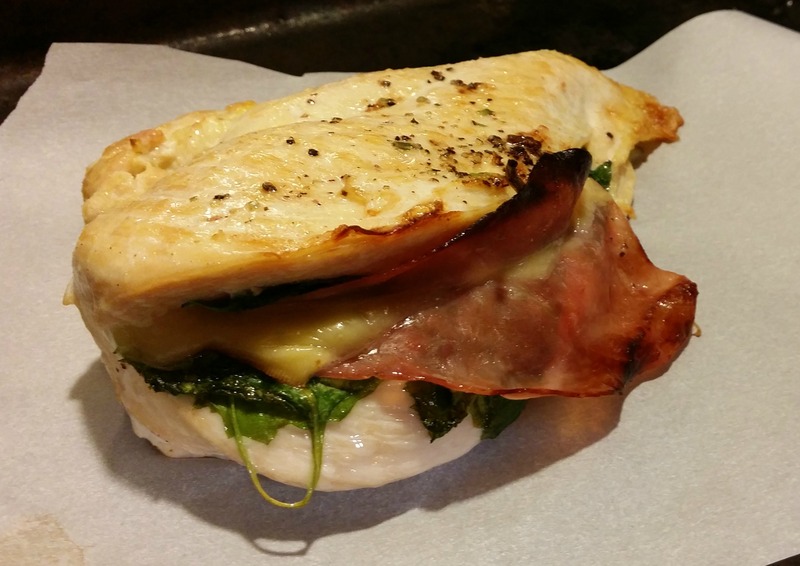 What traditional foods should be presented and how should they be prepared? The task of deciding on a menu can be daunting when you are overly excited for the event. It can be doubly daunting when you are not very experienced in preparing for a gathering. We want the experience to be perfect. After all, the food is a very important, if not the most important element. 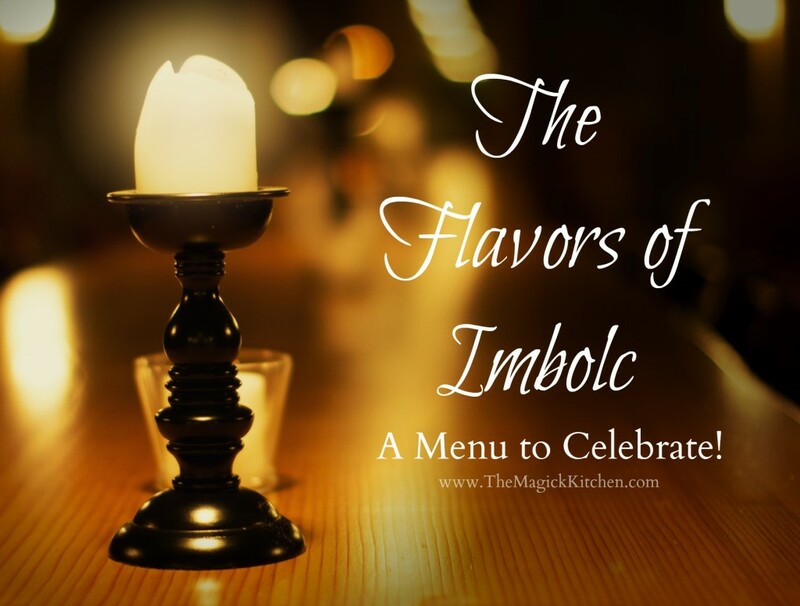 I hope I can help in this area with the Imbolc menu I have prepared. Some of the most prominent known foods for this festival include milk, breads, cream, root vegetables, and cured meats. These foods are reflected in just about all of our winter and early spring celebrations. These foods are hearty and nutritious, and last the long cold winter months when stored properly. It is for this reason that these foods are often considered stables. I have compiled a delicious menu incorporating foods that are considered traditional, without sending you all over the globe collecting techniques and ingredients. You will not have to worry about canning and drying items you might not normally consider in your kitchen. I focused on seasonal foods most of us can find locally. This is an easy menu filled with color and flavor. I stuck with the tradition of baking a Bannock, because this tradition is so easy you will wonder why you are not baking these more often. You can also incorporate a variety of other foods (like nut & berries) in the batter allowing you to create your own unique flavor. The menu is small, but not void of color and appealing flavor. Simplicity is sometimes the best artistry, which is why I mean to keep things simple. The soup alone is a satisfying meal. When paired with chicken and roasted root vegetables, it makes a very hearty feast. While the Bannocks (or scones) are a light dessert you can dress them up with cream, to give them extra richness. It is important to make things simple so you can enjoy your celebration without un-necessary searching, preparations, and anxiety. We start with our soup course. 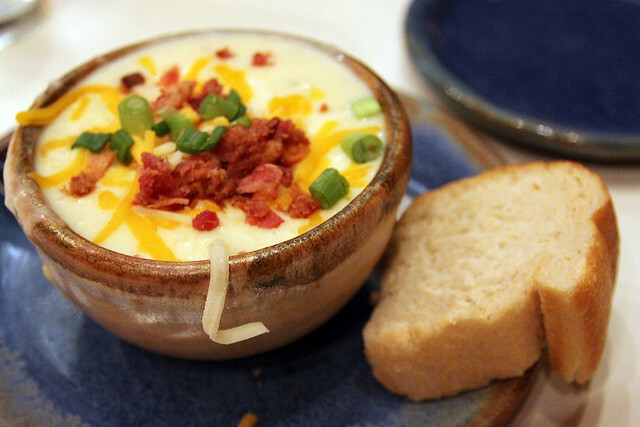 A lovely and easy to prepare Potato Soup made in your slow cooker. Next, we have Stuffed Chicken Breasts. This dish will have you looking like a gourmet chef without sending you running and screaming out of the kitchen. Next we have our Roasted Root Vegetables. Color is the name of the game here. 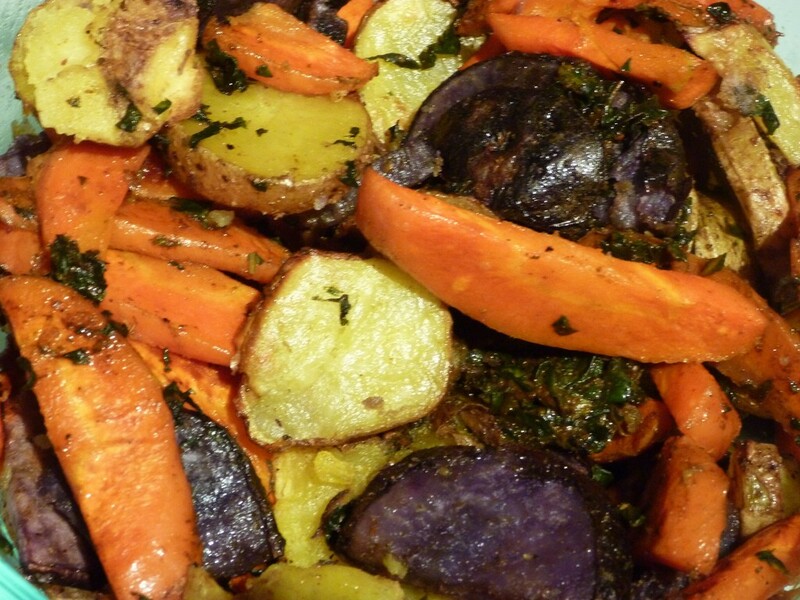 I used a variety of root vegetables including fingerling potatoes that come in many different colors. Lastly, we have our Bannock. This is a traditional Scottish bread or cake that is super easy to make. 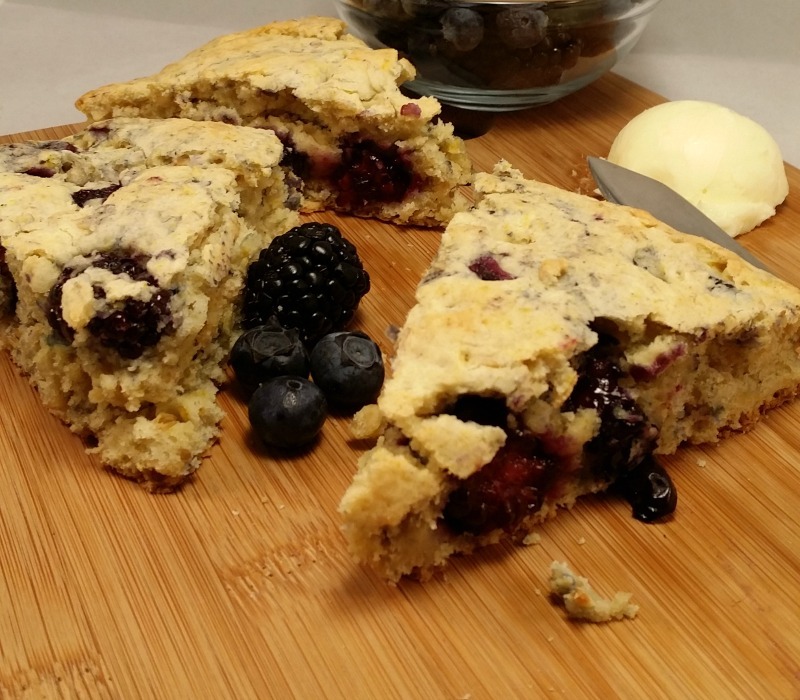 I added blueberries and blackberries to this recipe, you should try it with other types of berries and/or nuts. Less fuss and more fun! Just how I like it! I told you it was painless. The menu items like the soup and roasted root veggies can be made ahead of time. This will save you a lot of frustration and anxiety. WAIT! I forgot a few things! This celebration isn’t just about the food! Although, this dinner menu will set a fabulous tone for your Imbolc celebration, we don’t want to stop there. Another clear element of Imbolc is fire. During your Imbolc feast light the table with many candles, stoke the fire in your fireplace, and create a pleasant indoor atmosphere, and ENJOY the feast! In addition, Imbolc is a time for indoor activities and spiritual practices. There is a large emphasis on divination, crafting, and making wishes for the coming spring. Imbolc is a great time to engage in some enlightening activities, like fire divination and tea leaf reading. Oh! Don’t forget the aspect of hearth and home! Since most of us are close-up in our homes, due to the freezing temps, and wind chills of negative ridiculous… Imbolc is a great time of year to work on the inside of our home. Take this opportunity to get your home ready for spring. Check out a previous post on Clean Home Scent Spells, and the 9 Day Deep Clean. These are part of a 3 part series I wrote for creating a clean home and maintaining it. These tools will help you get your home in great shape. Once you complete the 9 Day Deep Clean, you will then want to maintain that clean with this Weekly Maintenance Checklist. With that said, let’s get cooking! I wish you a Blessed and Joyful Imbolc! Tell me what you think. Has this post helped you, and were you inspired? I love to know what my readers are up to and how you put my thoughts and experience to use in your world. Also, if you have any suggestions on subjects for future posts let me know your thoughts. As a solitary practitioner living with a couple of non-religious, not particularly spiritual people, this post has helped me to think about how making dinner and eating it can be a ritual in and of itself. Moreover, as I have spent the last few years working on my connection with Earth and am at a point in my life where moving to connect with Fire is important to me, cooking for Imbolc looks to be a wonderful way of combining the two. Thank you so much; this was the creativity boost I needed to make it though the end of January. So happy to have found your blog & this in particular. I am a solitary eclectic with a heavy bent towards kitchen witchery. I am looking forward to making my family a delicious Imbolc feast and thanks to your guide & recipes I feel it will be a huge success!